Discussion in 'Map Factory' started by luxatile, Mar 11, 2010. RED has a base covered by an alpine oil digging site (I guess). 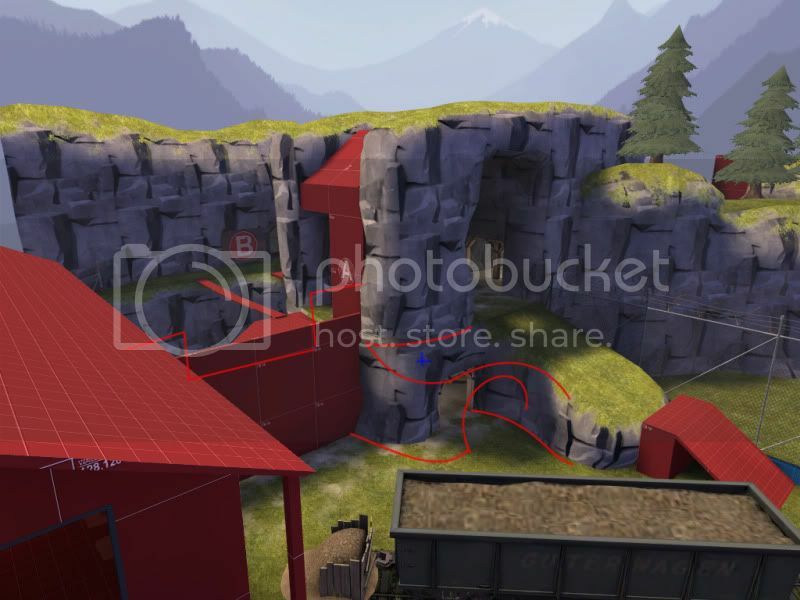 BLU attacks from a small lumberyard in this attack and defend map in the gameplay style of Gorge. It has three points in one stage. Lovely and charming Map Can't wait to see this as Beta. HAHA anyways if you need new textures i will work some for you. The defenders have to last for WAY too long, and if it's going to be multistage, it should be about half as long. No team should ever have to hold out for more than 7 minutes, at most, 10 minutes gets repetitive, boring, and the players get irritable to boot. As for the map itself, it had it's moments, and for an alpha 1, it was pretty enjoyable to play. Also, Shell is coming along slowly but surely. Added a game_text to answer all your important questions, including "WTF ONLY TWO POINTS!!!". Pushed the BLU dropdown a little further and added cover to make it easier to attack from that position. Removed the path that goes from the pit and behind B. Moved the path that goes directly to B a little to make it slightly longer. Removed the shortcut to A because it would make teleporters useless. Moved the healthpack from the pit by B below the dropdown, and replaced the old one with a small healthpack. Downgraded ammopack next to B to medium. Upgraded ammopack by the roof of B to medium. Changed RED spawn time to default (10), increasing it to 10-20 seconds. To compensate, increased BLU spawn time to 3-6 seconds. Reduced timer from 6:00 to 5:00. Reduced additional time for attacking B from 7:00 to 5:30. This is just a mini update for a small test. Change the ground so the grass doesn't go through. Same with the control point. Apart from those minor things I felt that the second point was pretty much impossible to cap. You might want to remove some of the cover the defending team has or make it less sentry friendly. Some of the paths to point B seemed a bit confusing even though they only led one way. I found myself walking around a couple of rooms multiple times only to end up where I started. Looks great though, nice job! Thanks for the feedback, I'm not sure where you'd be going in a circle though. Either way I'm tring to redesign the connectors between A and B for the next release. gameday bump. The timer was a tad long, and the huge open space at the last point after the closed tunnels didnt work to well. The first point played very well though. I almost want to tell you to turn the first point into a building (as it already has an interesting shape to it, and would be better optimised). But it would probably lose its current character. Just bare it in mind though, as i feel it would look more natural. Remove the defensive fence on the catwalk there, but provide more significant pieces of cover at each end. It was annoyingly hard to shoot over, made it awkard to jump down on enemies, and provided more of a novelty shooting gallery for snipers. I put in a blue cross too, if you can see it, just infront of the point. Turn that into a small health pack. 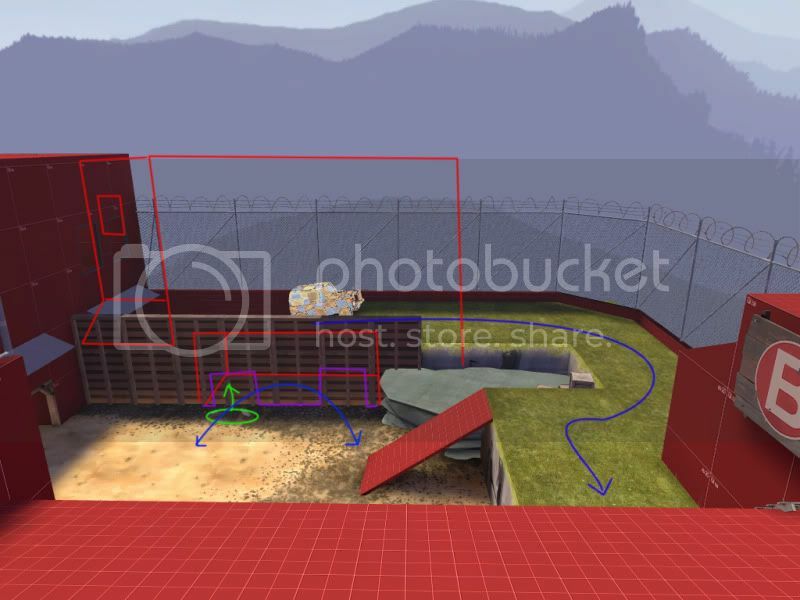 The BLU's are walking pretty far to that point from the spawn; and maybe move the medium health kit that's infront of the train car further back towards the walls of the blue building. Also convert the window that exits onto that catwalk into a doorway. It seems silly as a window and makes the path seem less significant. I realise this is only an alpha but a good 33% of my deaths were from getting stuck on your doorframes. Your roof made it rather problematic for attackers. It provides huge sight lines for snipers, and soldiers get a good 4 pot shots minimum at players before they have to jump down to engage and finish the job. I would recommend not allowing players to just walk up onto such advantagous ground. 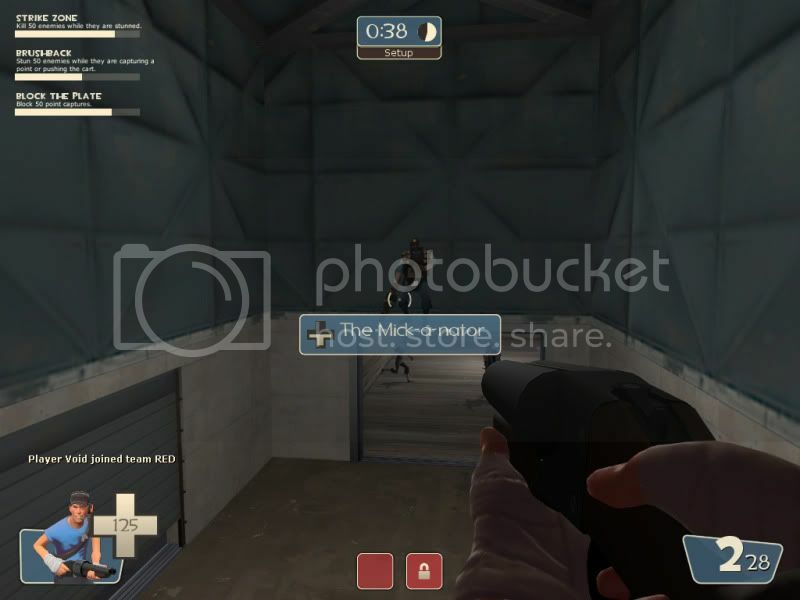 Move the window down to the left of the B sign (for snipers), and force soldiers to sacrifice some health for that height advantage (rocket jumping). Likely hood is that there's a medic who's over healed him anyway. Just make sure that it's a little more balanced. Because coming up the middle as BLU literally feels like staring down the barrel of a gun. This was probably the most significant issue with the map. Players were practically forced up the right flank (BLU's perspective) since it was A) more direct and B) had more cover/exposed players less. Going up the middle was suicide as it was flanked on all sides by occupiable canyon edges and walked right up a major sniper sightline. The far left flank was no better. Although there was some cover, the walk from beyond that cover to the point was open to fire from RED defences behind the point, passed a major sniper sight line, and was a long route at that. Build up that far left flank (BLU's perspective) into a building that provides good advancing cover. Similar to the affect of the buildings before Goldrush's stage 1 CP 2. If you add in a room below the building and move the item drops into it. Turning it into a large health pack will get more people less afraid to use the middle. Finally, i don't know whether you modify the spawn times after the capture of the first point, but walking from spawn to the final point was a bit of a trek without sufficient engineer support. The round time seemed long. Capping the first point took a reasonable amount of time, but i found the last point was always 10 minutes long. My team had trouble breaking through for a good 4 minutes and it seemed near impossible at the time. I wasn't alive at the time but right when i died we must have punched a hole and got the point because we did win in the end (7 minutes??). But i put that largely down to the fact that although they had a lot of time to react to assault and shoot at them during assaults, they couldn't really move forwards and counter attack; they pretty much had to huddle in cover behind the point, and attack from their when ever the point was directly threatened. Holy crap, giant post of win! I like your suggestions for A, I'll see if I can do something similar. It's staying a rock formation, though. I like your idea for B's middle a lot. For a2 I've already pushed it a little further up, but it didn't seem to help much, so I think I might use your idea instead. I think I'm going to redo the "connector" cave entirely as well, some people said they were confused and I bet that's where it came from. The instinct after capping A was to continue pushing, which inevitably lead into the cave which had 2-3 exits on it's right wall, which lead to B. The only thing that was really awkward was that it was effectively a giant U turn, from A to B. There was almost no sense in taking the long left flank (BLU's perspective) when you could jump out the doorway on the right flank and be on the point in no time at all. The only other things i really noticed were that getting to the BLU sniper windows was a moderately long winded walk down a corridor, which felt unnatural. Especially since a lot of the rest of your map was well scaled. I didn't really use that path as i only took a wrong turn down it once as scout, whilst running away from pyros. Saw that it had sniper windows and died. My concern with that would be that you significantly remove snipers from combat. They would have no team support if they did get flanked and ambushed, but flanking and ambushing probably wouldn't happen all that often due to how far out of the way that flanking is/takes. Some might call that balance, but it's never really good to seperate players that much. What i might suggest though, is turning B's building 45 degrees to face the wall which BLU exits from. Or maybe even 90 degrees to fully face it, but that would probably mean reconsidering the significance of each flank. It would make the left flank more balanced with the right as the comparible time travelled was something like 3 seconds versus 12-16 seconds. Making the right flank exit almost a no-brainer. So if you did, you'd probably not need to make that new building so long. But it depends on the changes you already made since you said you pushed the point back a little bit. Expanded the "dropdown building" by B. It is now longer and there is a full health pack below it. Added a doorway to the "dropdown" from the cave, to make it easier to flank. Turned another one of the exits to B into a window to make camping harder for RED. Changed the short upper path to B back to the way it was in A1, but changed the ramp for boxes to it's less inviting to use. Downgraded the ammopack by B's roof to small again. Fixed clipping issues on fences by B.
I had loads of fun playing this map, and although it felt quite long for blue to cap the second point, they always just did which was good. I didn't really get much action as I was an engineer but on blu, offensive engi had several great spots to set up in, even managing to repel both a demoman and ubered heavy simulatenously at one point, just after the first capture zone. There was an issue with snipers at both caps, but not so much in the area joining them. I'm not sure what you can do, but I know on the second point, blu snipers had a lot of area they could shoot at. Well, I guess the main problem we could all agree on (?) today was that BLU should be able to capture the first points easier. At least the very first one. 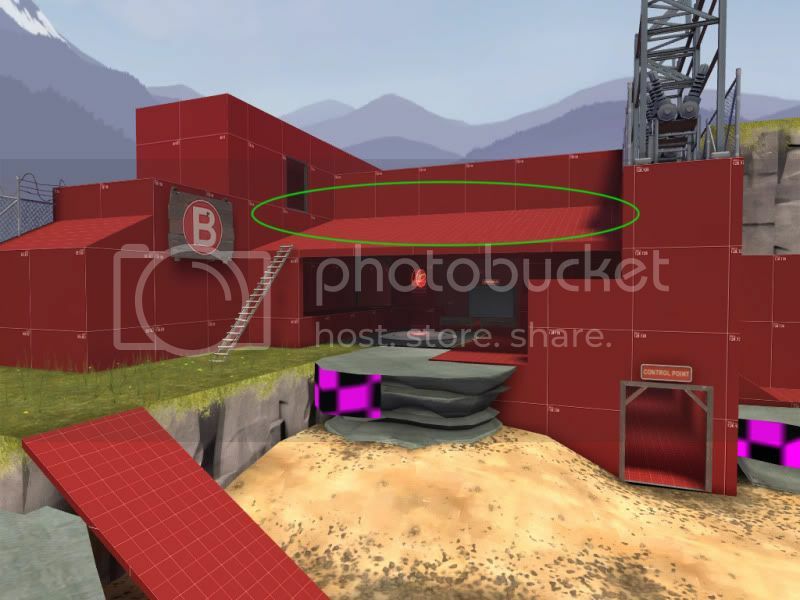 So, I'm going to need some suggestions for how to change this, because I'm having a hard time coming up with something, apart from weakening a particular sentry spot. About Snipers; I like to keep Snipers useful. One sniping a good amount of people is better than a one looking at a wall - because there will always be one. Really fun test today. However, I would add another path to the right of the first point for easier flanking.